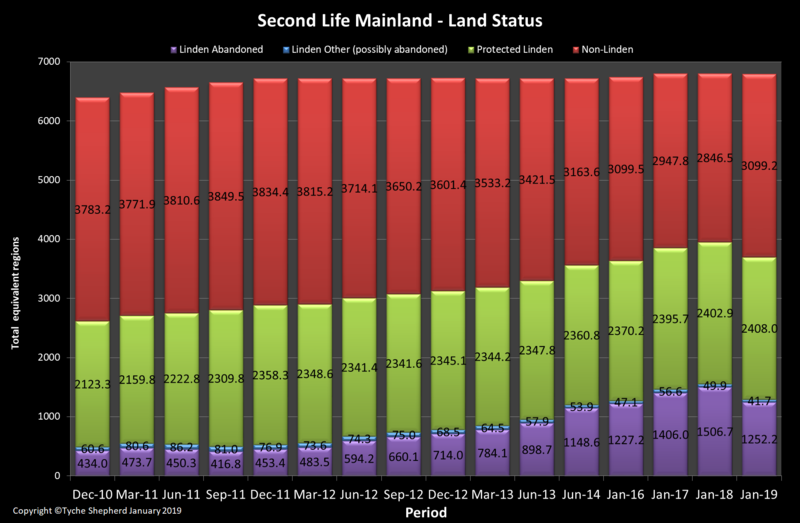 On Wednesday, January 16th, Tyche Shepherd published her 2018 Mainland Census, examining the overall state of Second Life Mainland, and it makes for interesting reading, as it offers the first “external” look at how Mainland is faring since the pricing restructure introduced in March 2018 (see Linden Lab announces SL Mainland price restructuring). As we’ve seen with Private Estates 2018 looks like a small revival for Mainland . Ownership is up (though Linden Home Ownership is down) and Owners are holding more land than before (Not surprising with the changes in Tier and Free Land Allowances) Larger land holders have tended to decrease their holdings but there has been a lot more active owners at the lower end. Abandoned land has significantly decreased and there has been some increase in Protected Linden land. Lab “ownership” of Mainland has decreased by 6.5% through 2018. The total number of Mainland parcel was up on, with 132377 parcels held by 60388 unique holders (split between 49084 individual accounts and 11254 groups). This compares with 125010 parcels among 58244 holders at the end of 2017. 31056 of these parcels are directly owned by Linden Lab. The mean size of parcels held by private land holders is 3366.5 Sq m, up by 82 sq m compared to January 2018. 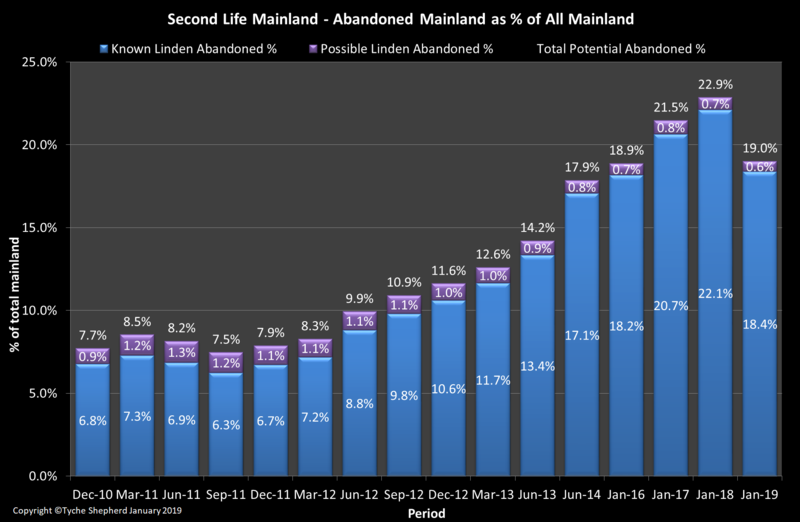 Abandoned Mainland has fallen by just under 4% as a total of the available Mainland (from 22.9% of all Mainland to 19%) – the first such drop since September 2011, bringing abandoned land down to a level last seen in at the end of 2015.The cause of this is undoubtedly the Mainland pricing restructure, which lower tier rates by around 10%, doubled the amount of “free” tier to 1024 sq m and – equally importantly – substantially relaxed the rules for obtaining free land. The rate at which land was abandoned also decreased in 2018, most likely again a result of the pricing restructure. Total Monthly Mainland Tier, with the new tier rates applied, is estimated at US $630,786, down by 8.9% (US $61,479) on the January 2018 rate. The number of occupied Linden Homes fell slightly in 2018, by 3.1, although the total number of homes remained constant. There is no direct evidence to support this being a direct result of the Mainland price restructuring; it could be part of a general sine curve of ups and downs in the popularity of Linden Homes. Unfortunately, past census reports no longer appear to be available to examine due to the SL Universe move in 2018. However, I wouldn’t be surprised if the drop wasn’t in part fuelled by some people trading their 512 sq m Linden Homes to gain a full 1024 sq m of “free” tier. The price restructuring does appear to have stimulated the “lower” end of the Mainland land market (i.e. among those holding smaller amounts of land), although overall holdings among larger land holders has, as Tyche notes, decreased slightly. To be honest, given the Lab’s feedback on the popularity of the pricing restructure, I had been expecting a slightly larger reduction in the amount of abandoned land as a total of Mainland (possibly 6-8%). As it is, abandoned land still represents a significant amount of the Mainland product, which has – other than 2011 – tended to show a year-on-year growth since 2010. Ergo, any reduction is welcome. In terms of looking ahead, 2019 presents an interesting year. On the one hand – and assuming no significant Mainland surprises are suddenly announced, there is no reason why the acquisition of abandoned land should not continue, even if at a slightly slower rate than may have been seen in 2018. On the other, there are a couple of big “unknowns” that are to be unveiled in 2019: the alteration to Premium subscriptions, and the opening of the new Linden Homes continent (plus any plans to grow it). The latter in particular opens up a series of questions relating to Mainland size, abandoned land, and possible trends, as I noted in Second Life: state of the grid, 2018. Chief among these is the potential for abandoned land to increase in 2019 as a result of people both deserting their Linden homes in favour of the new offerings (which it turn raises questions as to what will be done with the existing Linden Home regions that might become sparsely populated), or even for other Mainland parcels to be abandoned in favour of the new Linden Homes. Obviously, all of this also depends on how the new Linden Homes are offered, again as noted in Second Life: state of the grid, 2018 – and what incentives are offered through any revamped Premium subscriptions that are offered, and which might encourage more users to go Premium and possibly invest in Mainland. For the full breakdown of the census and charts – all of which make for interesting reading, please refer to Tyche’s post. Update: The Bluesteel RC channel was updated with server maintenance package 19#19.01.09.523003, comprising logging to gather baseline information on simulator performance in various areas of interest together with additional logging. As always, please refer to the server deployment thread for the latest information and updates. There was no deployment to the SLS (Main) channel on Tuesday, January 15th, 2019. There will be at least one RC channel deployment on Wednesday, January 16th, 2019. This will have extra back-end logging, but nothing visible to users. Current Release version 6.0.1.522263, dated December 5, promoted December 13. Formerly the Spotykach Maintenance RC viewer – No Change. Estate Access Management (EAM) RC viewer, version 6.1.0.522564, December 19. BugSplat RC viewer, version 6.1.0.522614, December 18. This viewer is functionally identical to the current release viewer, but uses BugSplat for crash reporting, rather than the Lab’s own Breakpad based crash reporting tools. Love Me Render RC viewer, version 6.0.2.522531, December 18. Environmental Enhancement Project (EEP) viewer, version 6.0.2.522550, December 18. Bakes on Mesh project viewer, version 6.0.1.522127, December 7. Obsolete platform viewer, version 3.7.28.300847, May 8, 2015 – provided for users on Windows XP and OS X versions below 10.7. This viewer will remain available for as long as reasonable, but will not be updated with new features or bug fixes. The hover height / vertical position issue that has seen tiny and very small avatars incorrectly hovering above the ground since November 2018 – see BUG-225893 – should now hopefully be fixed. The problem lay within changes made to the back-end Back Service, which manages the overall avatar appearance. The Lab had been working on trying to locate the root cause of the problem for some time, hampered by the fact a consistent reproduction of the issue when tweaking things to see what might be the cause proved difficult. However, a fix was developed in week #2, and passed to the Lab’s QA team for testing. The fix was deployed on Monday, January 14th, 2019. As per the notes on the update, “any avatars experiencing issues with hover height will need to change outfits in order to help you stand on the ground. It is anticipated that a broader server deployment of EEP (currently on a limited deployment on the Snack channel) will occur in week #4 (commencing Monday, January 21st, 2019). This will hopefully see EEP go RC-wide on the main grid, and will be accompanied by a viewer update with further UI tweaks, bug fixes and (hopefully!) the additional render updates to enable things like crepuscular rays (“God rays”). rider will also be updating the LSL documentation on the SL wiki as it pertains to EEP. Project Viewer – via Alternate Viewers wiki page. EEP sneak peeks forum thread. is a topic that often comes up for discussion. While Animesh has potentially opened the door to better means of controlling NPC, creatures, etc., there are cases where on-the-fly control of your own avatar would be a help (e.g. having more control over a hug). The pupeteering project was originally started to provide such a means of additional animation control. This reached the point where the results would have been confined to the user’s own world view (so not seen by others), but if followed through, it would have also included the network layering so that the result of pupeteered avatars would have been seen by all. However, this work was eventually put aside in 2011. A more recent project, based on code contributed via the Black Dragon viewer is in progress, but (I believe, as I’ve not looked into it to any great depth) this will be more constrained in scope. The hover height is an interesting little AV position mod … we’ve been brainstorming (warning – I think there was beer involved) with ideas like extending that, so for example you could adjust a hand position during a static pose. This is all just playing with ideas, however. However, any in-depth work on the animation system is liable to require something of a deep dive into the system’s foundations – which probably won’t be easily countenanced at the moment. Animesh: Simon indicated there has been further internal discussions on what might be included in any Animesh follow-on project, with feature request BUG-22815 “Much needed Animesh specific constants for llGetObjectDetails()” being looked at in particular. LI for Animesh humans continues to be a concern; while it is noted a “reasonable” Animesh character can be made for around 28 LI, those using Bento can range around the 80-90 LI mark, possibly higher – which could limit their use. These discussions will likely continue through the “regular” forum for Animesh discussion: the Content Creation User Group. OS Updates: work is still progressing on updating the operating system used by LL’s servers. This will not only bring them up to a more up-to-date OS version, but is also seen as foundation work for moving services to the cloud.